Here are some new features and fixes for you to enjoy. Curio 9 can now import and export mind map files generated with the extremely popular MindNode app for OS X and iOS. The MindNode format simply includes node title information but it's a great way to start a mind map on your iPad or iPhone and then continue work in Curio when you get back to your Mac. 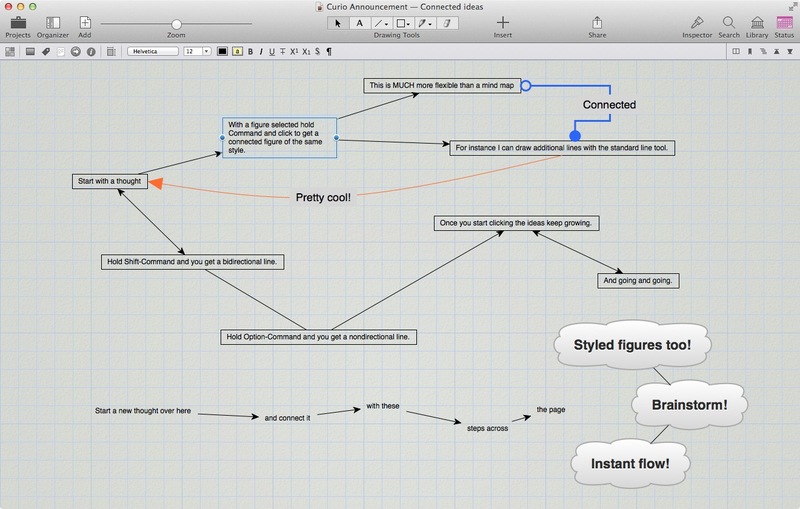 Just drag-and-drop the MindNode file directly into your idea space and we'll turn it into a native Curio mind map. 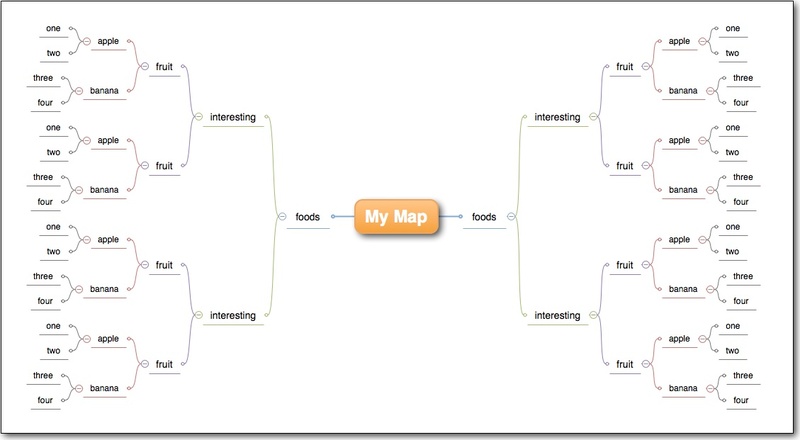 To export a Curio mind map in MindNode format, select the mind map within Curio and use the Share toolbar button. Note that formatting and layout information such as fonts, shapes, coloring, and positions are not imported or exported. 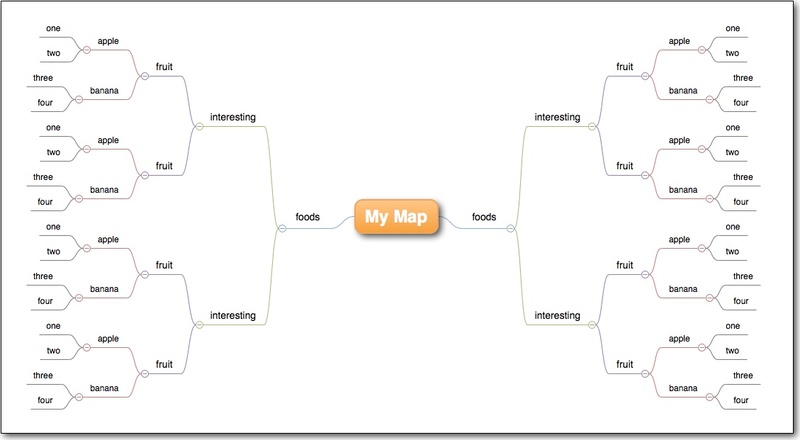 Instead, after import, the default Curio mind map style is applied and the mind map is automatically laid out. Also currently Curio doesn’t import or export images or other asset files (aka attachments). After opening an exported mind map from Curio in MindNode, you will need to force a re-layout by selecting the central topic node and clicking the Fold toolbar button then the Unfold button. Curio has supported connected figures for easy graph and flowchart creation since Curio 6.4 back in 2010. This is a great way to quickly create new figures on the idea space instantly connected to another figure with a directional, bidirectional, or nondirectional line. For Curio 9.1, we're extending this functionality so you can now connect existing figures just as easily with a quick drag-and-drop. We're also adding a new keyboard modifier combination so you can create a dashed connection line, which is pretty cool. As before, these are true Curio line figures so you can change the line color, dash pattern, width, and arrowheads using the inspector controls. You can also double-click on a line to add line labels, or right-click on a line and add one or more midpoints to make it a multipoint curved or orthogonal line. Release the mouse and figure A will move back to its original position and the appropriate line will be created connecting figure A to figure B. If you use the underline figure shape in Curio with radial, left, or right mind maps here's how we used to render it. This only kicks in if you use the underline figure shape with a 1 pixel pen width but I personally think the result is much, much cleaner. On a related note, Curio now includes a new Curved Lines bundled mind map style which demonstrates the new mind map underlining feature. Added Show Checkmark to the context menu that appears when right-clicking on text figures. Hitting the Enter key on the numeric keypad (not the main Return key) will end editing of the current text figure. Use the new Enter Ends Editing advanced setting if you don't want that to occur. When doing an HTML Export, idea space names are cleared of any carriage returns as that can break the resulting HTML. Fixed crash situation which could occur in the tags mini meta popover when adding or modifying tags using the actual Tags inspector. Fixed issue where collapsing a mind map node which contains grouped figures may not hide the contents of that grouped figure. User-specified margins for borderless+unfilled text figures are now ignored when aligning figures using snap guides and when aligning list prefixes with items in the list. You can now use the Return key with text figures in a pinboard to enter multiple lines.